Jack Daniels Gentleman Jack. 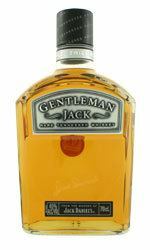 Gentleman Jack is a rare bottling from Jack Daniels. On the nose it is soft but insistentthe initial sweetness gives way to a dryness. Slightly less overt charcoal-phenol than the regular Jack Daniel's. On the palate it is smooth and very toasty. On the finish it has lots of cinnamon. lemons.